Speyside distillery Mortlach has unveiled the first Scotch whisky from its new Singing Stills Series – a 47-year-old single malt, priced at £10,000 (US$13,295) per bottle. The Diageo-owned brand will release just 94 bottles of Mortlach 47-Year-Old, which was distilled and filled into three refill American oak hogsheads in April 1971. It has been bottled at 46.8% abv. The bottles will be allocated to buyers through a global online registration process, which will be overseen by Justerini & Brooks. Registration will open at midnight GMT on 9 April 2019 and will remain open for two weeks until 6pm GMT on 23 April. 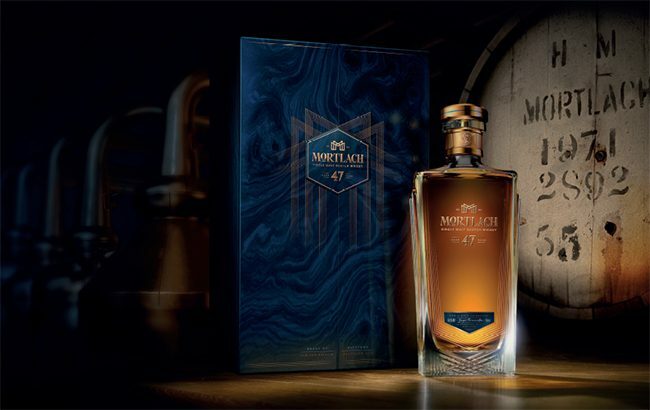 Furthermore, consumers can register their interest to be one of 47 guests to attend the global launch of Mortlach 47 on 9 April in London or Singapore. Those keen to be part of the tasting must register their interest online at exceptionalwhisky.com between 19 and 31 March, and successful consumers will be notified on 1 April. In addition, Bonhams will auction bottle number eight of Mortlach 47-Year-Old for charity ahead of the global registration on 25 March in Singapore. All the money raised from the sale will be donated to the Daughters of Tomorrow charity, which works to support underprivileged women by giving them skills and confidence to make a living for themselves and their families. Ewan Gunn, global Scotch ambassador, said: “The sound of the [Mortlach] stills is as distinctive to the distillery as the taste of the whisky. “Mortlach’s exceptionally bold and complex flavours, effortlessly bridge the gap between mellow and smoky. Last year, Mortlach extended its recently revamped range with the launch of a 14-year-old single malt exclusively in travel retail. Future releases as part of The Singing Stills Series will be revealed at a later date.